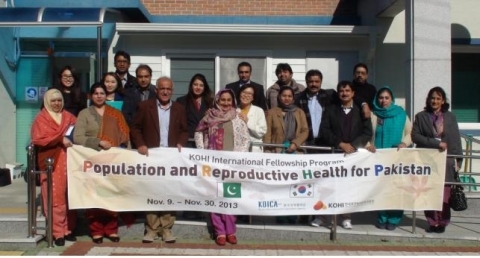 KOHI successfully concluded Population and Reproductive Health for Pakistan Program with KOICA. CHEONGWON--(Korea Newswire) November 29, 2013 -- Korea Human Resource Development Institute for Health and Welfare, KOHI (President; Ryu Hoyoung) successfully concluded ‘Population and Reproductive Health for Pakistan’ Program with KOICA. Delegates from National or Local Government officials engaged in the field of population and reproductive health from Pakistan participated in the course from 9th November to 30th November in 2013. The course was designed to focus on population and reproductive health. Lecturers from Ministry of Health & Welfare, Planned population federation of Korea, and Association of population delivered. Participants also visited Masan national hospital, Sejong city Public health center, Health Insurance Review and Assessment Institute(HIRA), Soonchunhyang hospital, Primary health post to see and learn the programs and projects for population and reproductive health in Korea. Ms, Sultan Nabila, MNCH (Maternal, Newborn, Child Health) Program at Balochistan in Pakistan, said “ All things I experienced here are wonderful. The detail of the training course is well-organized and so practical.” She also expressed that she got many ideas to implement for improving the reproductive health in Pakistan. KOHI runs various International fellowship programs, including Maternal and Child Health Promotion in Latin America &Africa, Health Policy and Program Management, and Community Health Development.